Aim: The purpose of this in vitro study was to assess and compare the retention of zirconia copings luted with different luting agents onto zirconia and titanium abutments. Materials and Methods: Titanium and zirconia abutments were torqued at 35 N/cm onto implant analogs. The samples were divided into two groups: Group A consisted of four titanium abutments and 32 zirconia copings and Group B consisted of four zirconia abutments and 32 zirconia copings and four luting agents were used. 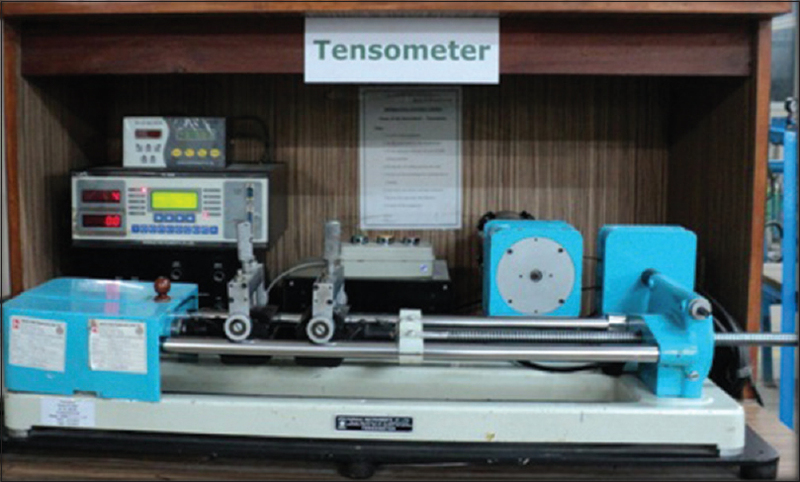 The cemented copings were subjected to tensile dislodgement forces and subjected to ANOVA test. Results: Zirconia abutments recorded a higher mean force compared to titanium. Among the luting agents, resin cement recorded the highest mean force followed by zinc phosphate, glass ionomer, and noneugenol zinc oxide cement, respectively. Conclusion: Highest mean retention was recorded for zirconia implant abutments compared to titanium abutments when luted with zirconia copings. Main goals of restorations in modern dentistry are optimal function and esthetics. The options for restoring edentulous areas have changed dramatically with the introduction of endosseous dental implants. Clinical decisions are not only limited to the selection of the type of implant but also the type of abutment and cement used. 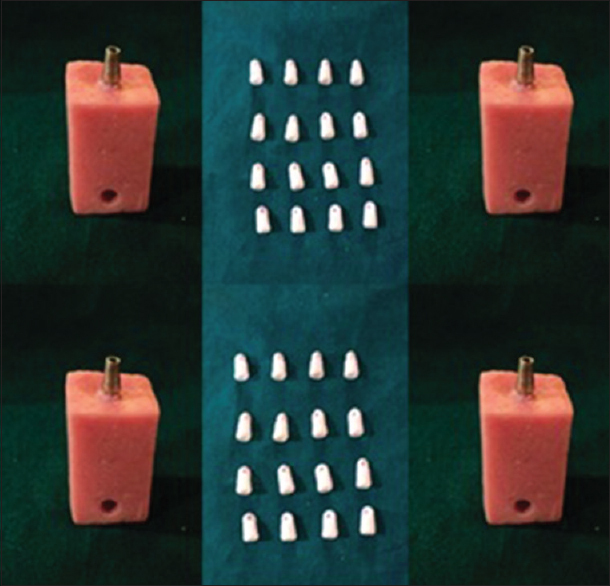 Initially, implant-supported prostheses were exclusively retained by screws, but with the development of new implant systems and rehabilitation techniques cement retained prostheses have become popular treatment option. Cement-retained superstructures over the implant abutments assure passive fit because of the cement layer between the framework and abutment. Other advantages of cement-retained implant restorations include improved direction of load, enhanced esthetics, easy access, reduced fabrication cost and time, simplified restorative procedures, and optimum occlusion excluding the interference of screw access openings. Limitations associated with the cement-retained implant restorations include low profile retention, when there is limited interarch space, retrievability, and presence of cement in the sulcus. Commercially, pure titanium has been widely used as an abutment material in implant therapy because of its well-documented biocompatibility and mechanical properties. Recently, zirconia implant abutment materials have gained popularity because of their better fracture resistance and superior optical properties over titanium. 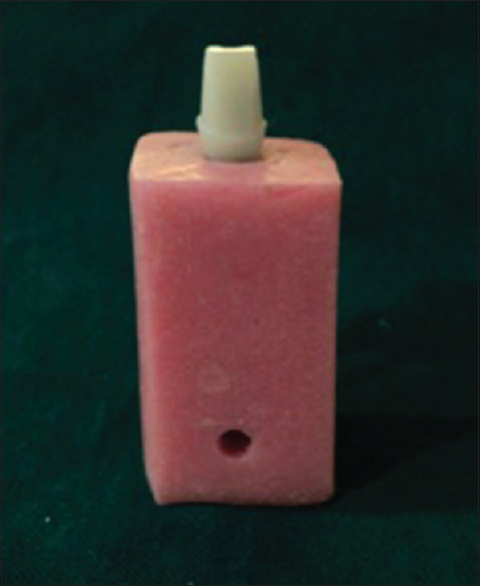 Selection of luting agent is very important for cement-retained implant prostheses and it is largely dependent on operator preference, convenience, and manufacturer recommendations. Ideal luting agent should be strong enough to retain the restorations yet weak enough so that restorations can be removed easily if required. The aim of this study was to assess and compare the retentive strengths of different classes of luting agents used to cement zirconia copings to titanium and zirconia implant abutments. Materials used in the present study included eight implant analogs (Collagen Meniscus Implant [CMI]), four titanium [Figure 1] abutments (CMI, hexed abutment), four zirconia abutments [Figure 2], and 64 zirconia copings (Lava, Zirconia 3M ESPE) [Figure 3] and [Figure 4]. The luting agents used were resin cement (Calibra-Densply), glass ionomer (GC gold label luting and lining cement), zinc phosphate (Harvard Cement), and zinc oxide noneugenol (Rely X™ Temp NE) cements. Samples were divided into two groups. Group A consisted of four titanium abutments and 32 zirconia copings. Group B consisted of four zirconia abutments and 32 copings. 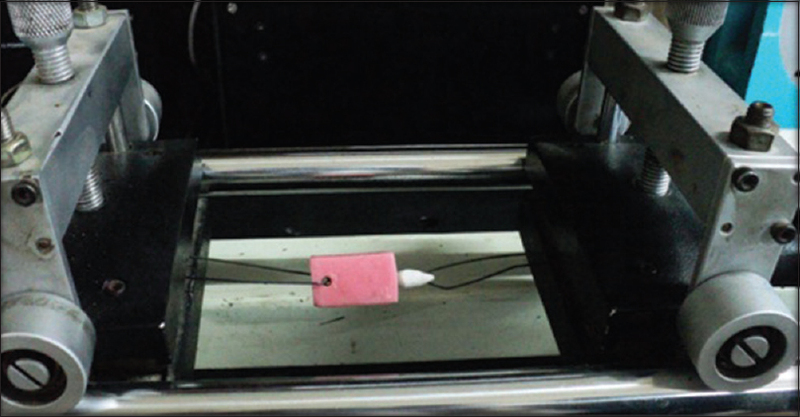 Resin pattern were made for zirconia copings; an extension was made on the occlusal surface of each coping parallel to long axis of the tooth to serve as a connector to the tensile strength testing machine. zirconia copings thus designed were milled with computer aided designing - computer aided manufacturing unit. Both Groups A and B were randomly divided into four groups each comprising specimens Groups 1-4. Zirconia copings in Groups A1 and B1 were cemented with glass ionomer (GC gold label luting and lining cement) cement, Groups A2 and B2 were cemented with resin cement (Calibra-Densply), Groups A3 and B3 were cemented with zinc oxide noneugenol cement (Rely X™ Temp NE), and Groups A4 and B4 were cemented with zinc phosphate cement (Harvard Cement). Each coping of all groups was sandblasted with 50 μm aluminum oxide before cementation. Cements were mixed according to the manufacturer's instructions and were applied in a thin layer to the inner axial walls of the crown. Each coping was seated on its perspective abutment with firm finger pressure and then placed under a 10 kg weight for 5 min and cementation was carried out [Figure 5]. Excess cement was removed with an explorer. Specimens were stored at room temperature for 24 h and immersed in artificial saliva for 7 days, after which specimens were thermo cycled 100 times between 5°C and 55°C with a dwell time of 10 s, dried and subjected to retention test. The cemented copings were subjected to tensile dislodgement forces using crosshead speed of 0.5 mm/min until cement failure occurred  [Figure 6], [Figure 7] and [Figure 8]. The same abutment was used with each of the coping and four cements were evaluated. Abutments were cleaned with a plastic explorer. 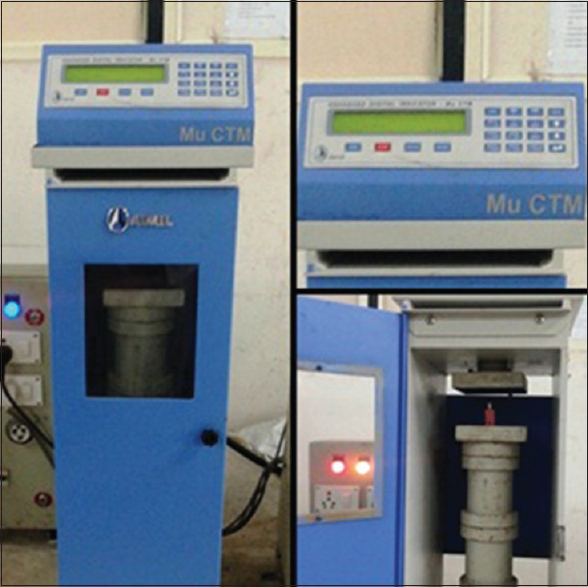 Abutments were immersed in an ultrasonic cleaner for 15 min and re-used. Results obtained from the retention test were statistically analyzed using factorial ANOVA test. Among the cements, the highest mean force was recorded in resin cement followed by zinc phosphate, glass ionomer, and noneugenol zinc oxide, respectively. The difference in mean force recorded between them was found to be statistically significant (P < 0.001) [Table 1]. 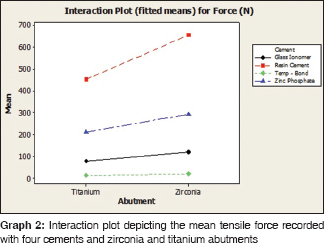 Between the two abutments, the higher mean force was recorded in zirconia and the difference in mean force between zirconia and titanium was found to be statistically significant (P < 0.001) [Table 2]. 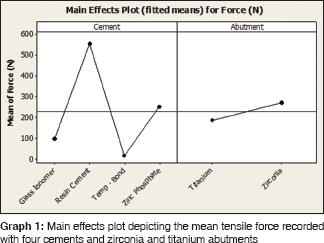 The interaction (joint effect) of cement and abutment on force was also found to be statistically significant (P < 0.001) [Table 3] and [Graph 1]. Noneugenol zinc oxide cement always had a lower mean force when used with titanium or zirconia abutments. Resin cement always has a higher mean force compared to other cements when used either with titanium or zirconia abutment. All the cements yield a higher mean force when used with zirconia abutment compared to titanium abutment. [Table 4] and [Graph 2]. Prosthetic rehabilitation of edentulous areas using implants has become a popular treatment modality. All ceramic crowns are used in implants more often than metal ceramic crowns to enhance esthetics. The most commonly used material in all ceramic being zirconia due to its high flexibility, fracture toughness, biocompatibility, and excellent esthetics. Zirconia abutments in comparison with titanium abutments enhance the esthetic effect especially in case of maxillary anterior implants, since they do not allow display of metal, unlike titanium abutments. Mansour et al. found that the rank order of cement retentiveness differed when tested on implants rather than on natural teeth. Among the four types of cements used to lute Zirconia copings, resin cement showed the highest mean force when used with zirconia as well as titanium abutments. The higher mean retention of resin cement, when used along with Zirconia abutments, is due to the presence of adhesive phosphate monomer in the resin cement that enhances the bonding between them. Sandblasting of zirconia copings also enhances the retention by increasing the microroughness of the surface. , Studies conducted by Barbosa et al. have proved that resin cements bond with the titanium alloy by reacting with metal oxides. The phosphate ester group of acidic monomer results in chemical bonding with metal oxides. Studies have also proved that sandblasting the titanium abutment surface with alumina also enhances the bonding between resin cement and titanium abutment. D'Amario et al. noted that bond strength of resin cement decreased when subjected to thermocycling, which resulted in weakening the bond between zirconia and resin cement leading to bond failure. Highest mean retention was recorded for zirconia copings cemented on to zirconia abutments when compared to titanium abutments. Zirconia copings when luted onto zirconia abutments, highest mean retention were recorded with resin cement followed by zinc phosphate cement and glass ionomer cement. Least mean retention was recorded with noneugenol zinc oxide cement. Zirconia copings when luted onto titanium abutments highest mean retention was recorded with resin cement followed by zinc phosphate cement and glass ionomer cement. Least mean retention was recorded with noneugenol zinc oxide cement. The above study provides a superficial idea about the retention of zirconia copings with four different types of lutings on to zirconia as well as titanium abutments, which will help the clinician in deciding during prosthetic rehabilitation with implant-supported restorations. The study also highlights the chemical and mechanical factors that influence retention of cements onto the abutments. Scanning electron microscopic analysis must be required to provide a more accurate analysis on the bonding mechanisms, which is a limitation of the present study. Ebert A, Hedderich J, Kern M. Retention of zirconia ceramic copings bonded to titanium abutments. Int J Oral Maxillofac Implants 2007;22:921-7. Abbo B, Razzoog ME, Vivas J, Sierraalta M. Resistance to dislodgement of zirconia copings cemented onto titanium abutments of different heights. J Prosthet Dent 2008;99:25-9. D'Amario, Campidoglio M, Morresi AL, Luciani L, Marchetti E, Baldi M. Effect of thermo cycling on the bond strength between dual cured resin cements and zirconium oxide ceramics. J Oral Sci 2010;52:425-30. Goknil EK, Ceylan G, Nergiz Y, Bahar EK. Luting agent effectiveness on implant crown retention. Int J Oral Implantol Clin Res 2011;2:7-11. Kokubo Y, Kano T, Tsumita M, Sakurai S, Itayama A, Fukushima S. Retention of zirconia copings on zirconia implant abutments cemented with provisional luting agents. J Oral Rehabil 2010;37:48-53. Pan YH, Lin CK. The effect of luting agents on the retention of dental implant-supported crowns. Chang Gung Med J 2005;28:403-10. Kim SM, Yoon JY, Lee MH, Oh NS. The effect of resin cements and primer on retentive force of zirconia copings bonded to zirconia abutments with insufficient retention. J Adv Prosthodont 2013;5:198-203. Mansour A, Ercoli C, Graser G, Tallents R, Moss M. Comparative evaluation of casting retention using the ITI solid abutment with six cements. Clin Oral Implants Res 2002;13:343-8. 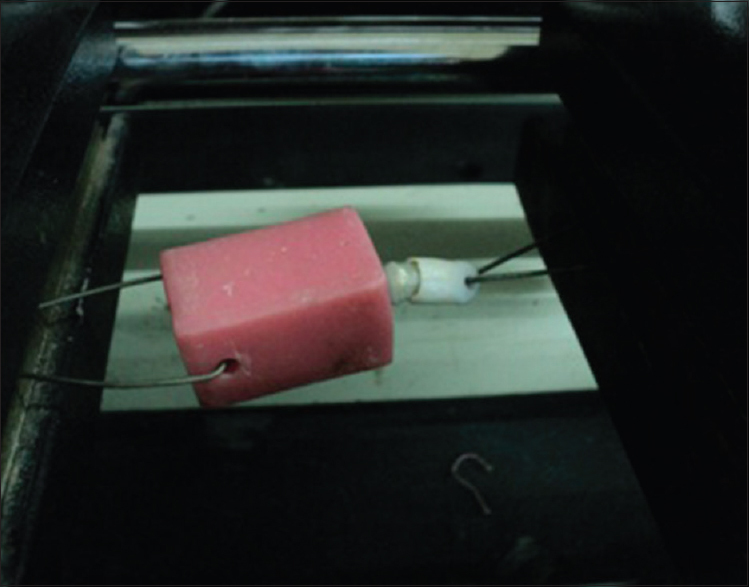 Blatz MB, Dent M, Sadan A, Kern M. Resin-ceramic bonding: A review of the literature. J Prosthet Dent 2003;89:268-74. Usumez A, Hamdemirci N, Koroglu BY, Simsek I, Parlar O, Sari T. Bond strength of resin cement to zirconia ceramic with different surface treatments. Lasers Med Sci 2013;28:259-66. Barbosa SH, Pelógia F, Daniel O, Antonio M. Durability of bond strength between titanium alloy and resin cement. Cienc Odontol Bras 2008;11:13-8. Squier RS, Agar JR, Duncan JP, Taylor TD. 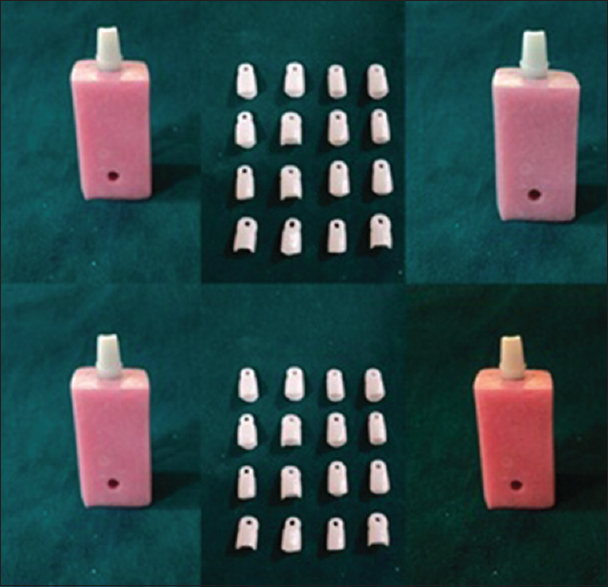 Retentiveness of dental cements used with metallic implant components. 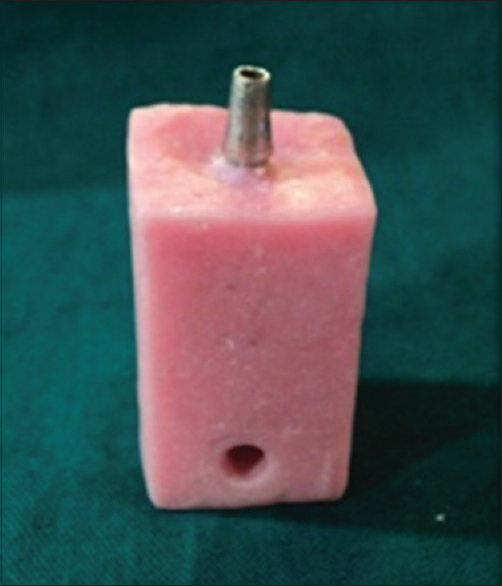 Int J Oral Maxillofac Implants 2001;16:793-8. Yu H, Zheng M, Chen R, Cheng H. Proper selection of contemporary dental cements. Oral Health Dent Manag 2014;13:54-9.